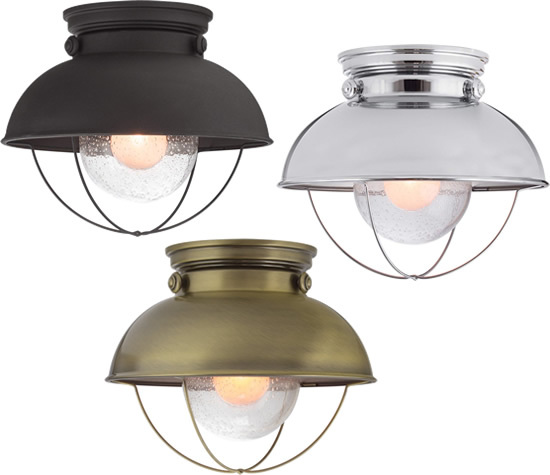 This industrial farmhouse style Bayside collection by Kira Home features a seeded glass shade and a chrome finish. A unique cage design surrounds the shade to provide that quaint farmhouse feel. Attention to detail adds to the quality of this flush mount. 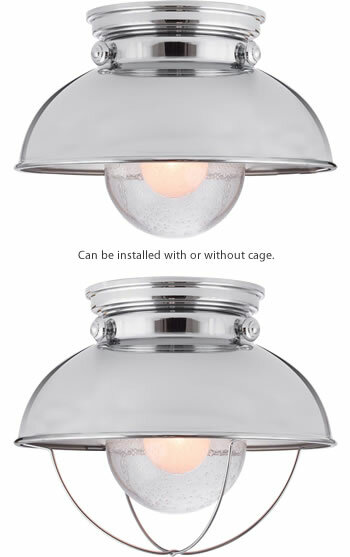 Can be installed with or without cage. 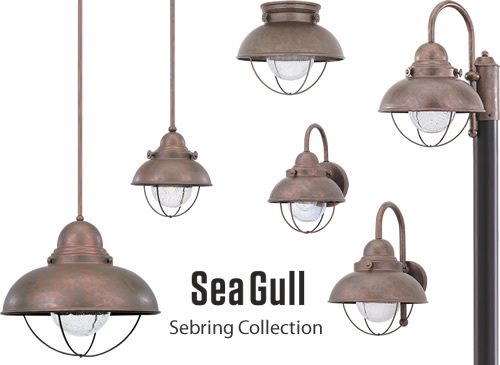 This industrial and nautically inspired Sebring collection by Sea Gull Lighting coordinates perfectly in coastal locations, while adding eye catching contrast to a rustic or farmhouse setting of any kind. Offered in Black, Brushed Stainless and Weathered Copper finishes, Sebring is a complete outdoor collection with small and large one-light outdoor wall lanterns, a one-light outdoor ceiling flush mount and one-light outdoor post lantern to unify any home's appearance. 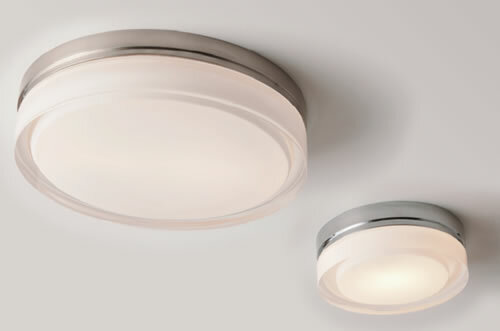 Incandescent as well as integrated LED are available. The advanced, integrated LED light source has warm-on-dim technology that warms in color when dimmed, and is California Title 24 compliant. Only lighting rated for Damp Locations or Wet Locations can be used outdoors. Damp Locations: Covered areas like a covered porch or patio that are completely protected from direct rain, even blowing rain in a storm. Wet Locations: Any area that may ever get wet has to have lighting that is rated for a wet location. Even if it is only occasional blown in rain or splashing. 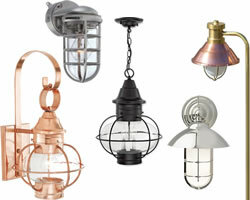 Use lighting rated for Wet Locations on open decks and patios or any other area that may be exposed to water. Beautiful round pressed glass shade with polished surface suspended from a die-cast base. May be mounted on the ceiling or wall. 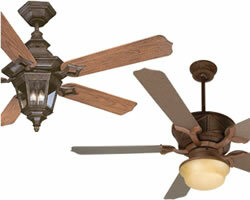 Available in three lamp configurations: incandescent, Fluorescent and LED . Large incandescent includes two 120 volt, 40 watt G9 base halogen lamps; small incandescent includes one 120 volt 40 watt G9 base halogen lamp; large Fluorescent includes two 13 watt 2GX7 base twin tube lamps and electronic ballast. 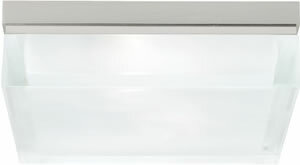 Large LED includes two 10 watt, 600 lumen, 2700K LED modules. Incandescent version dimmable with a standard incandescent dimmer. LED version dimmable with low-voltage electronic dimmer. 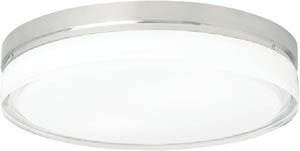 Incandescent version dimmable with a standard incandescent dimmer (not included). Compact Fluorescent and LED lamp options available only with Large Size. 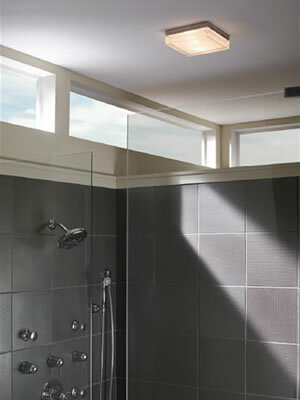 Clean square pressed glass shade with polished surface suspended from a die-cast base. 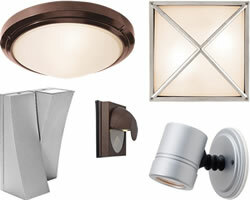 Available in three lamp configurations: incandescent, Fluorescent and LED . 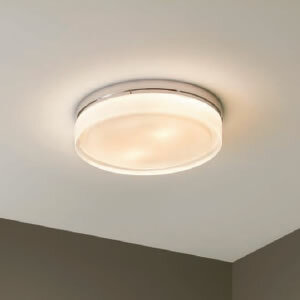 Large incandescent includes two 120 volt, 40 watt G9 base halogen lamps; small incandescent includes one 120 volt 40 watt G9 base halogen lamp; large Fluorescent includes two 13 watt 2GX7 base twin tube lamps and electronic ballast. 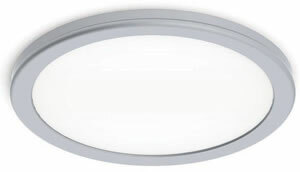 Large LED includes two 10 watt, 600 lumen, 2700K LED modules. Incandescent version dimmable with a standard incandescent dimmer. LED version dimmable with low-voltage electronic dimmer. Ceiling mount suitable for wet locations. ADA compliant. 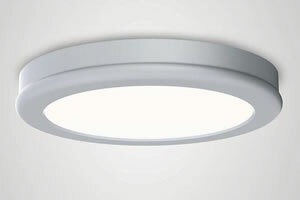 Geos Ceiling Mount - Multiple mid-powered LED source illuminate the diffuser uniformly and without socket shadows common in conventional flush mounts. 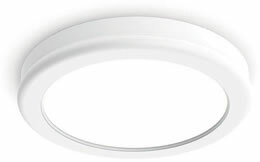 Lithonia ultra-thin Wafer LED Recessed have a narrow design and a remote driver box. Wafer LED can be installed in confined, hard to reach spaces and areas with shallow plenum. Available in square or round, 3-inch, 4-inch and 6-inch, with smooth or baffled trims in black, white, brushed nickel or oil-rubbed bronze finish. Rated for Wet Location - Can be used indoors or outside.